Better than expected December jobs report and ample new job openings attest to US economy strength. Will the SP500 continue the rebound? The minutes of Federal Reserve December 19 meeting were seen as more dovish than expected: ‘many’ officials thought they could be ‘patient’ on interest rates going forward, before the market slump in Christmas holiday period. They recommended the central bank should be “patient” and “a relatively limited amount of additional tightening” is appropriate. Latest US economic data indicated US economy is strong: better than expected jobs report showed 319000 new jobs were created in December, more than expected. And while the Institute of Supply Management’s reading of manufacturing came in lower as was expected, the decline was recorded from a historically high level, and the reading pointing to continued robust expansion in manufacturing sector. The same is true for the services sector. And latest Job Openings and Labor Turnover Survey indicated the number of new job openings still outnumbered unemployed Americans in November despite a decline from October. Positive economic data are bullish for US stock index. On the daily timeframe the SP500: D1 is above the 38.2 Fibonacci level, this is bullish. The RSI oscillator is falling but has not reached the oversold zone yet. 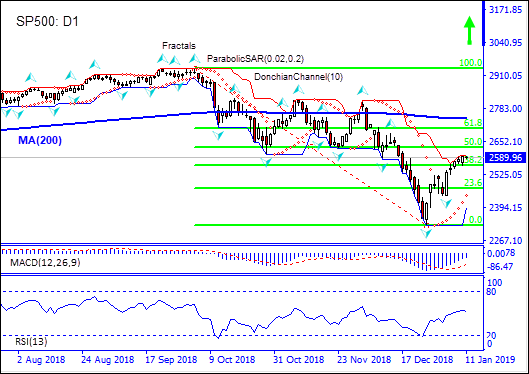 We believe the bullish momentum will continue after the price closes above the upper boundary of Donchian channel at 2597.72. This level can be used as an entry point for placing a pending order to buy. The stop loss can be placed below the fractal low at 2440.58. After placing the order, the stop loss is to be moved every day to the next fractal low, following Parabolic signals. Thus, we are changing the expected profit/loss ratio to the breakeven point. If the price meets the stop loss level (2440.58) without reaching the order (2597.72), we recommend cancelling the order: the market has undergone internal changes which were not taken into account.